Fernie is one of Southern BC’s best ski resorts, with the reportedly highest amount of annual snowfall out of any resort in the Canadian Rockies. There are 10 chairlifts, 5 bowls, and over 140 runs in the area, making it a great place to spend a few days in the powder. There are also a variety of summer activities like hiking, a zip line and aerial park, and a mountain bike area. There are also two other great ski resorts within an hour drive – Kimberly Ski Resort and Castle Mountain Ski Resort – if you are chasing the best ski conditions. Do as the Canadian’s do, and brave the cold air for long enough to enjoy passing the puck around or gliding across a frozen pond. 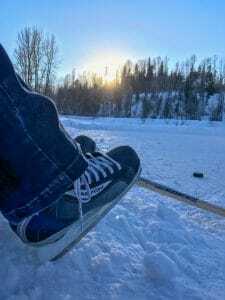 There are numerous free outdoor rinks in Fernie, including a maintained one at the courthouse or a more natural one along the river in Annex Park. Grab some rentals and head over to the north end of town where you can find a cleaned, small rink for skating in a beautiful snowy park surrounded by trees. Follow up with a hot chocolate! Fernie has some surprisingly good restaurant options for a small mountain town. No trip is complete without a meal at one of my favorite restaurants – the Curry Bowl! Grab some delicious Thai food after a long day outdoors to warm up, I highly recommend the Green Curry. They also cater to food allergies and have great gluten free options. For a quick meal, also try the Lunchbox for fresh salad, soup or chili on-the-go.